In a non-stick, medium-sized, 6-hole muffin tray, spray with non-stick spray, then add about a tbsp. of oil to each. Allow the muffin tray with the oil to heat up in the oven. Add a sausage half to each muffin hole and return to the oven. Meanwhile, beat the chickpea liquid/brine until stiff. In a separate bowl, sift the flour and baking powder twice, and then sift it into the beaten chickpea liquid/brine. Add the almond milk. Fold in the flour and almond milk. Working quickly, top each sausage with the batter and return it to the oven for about 15 - 20 minutes, until golden. 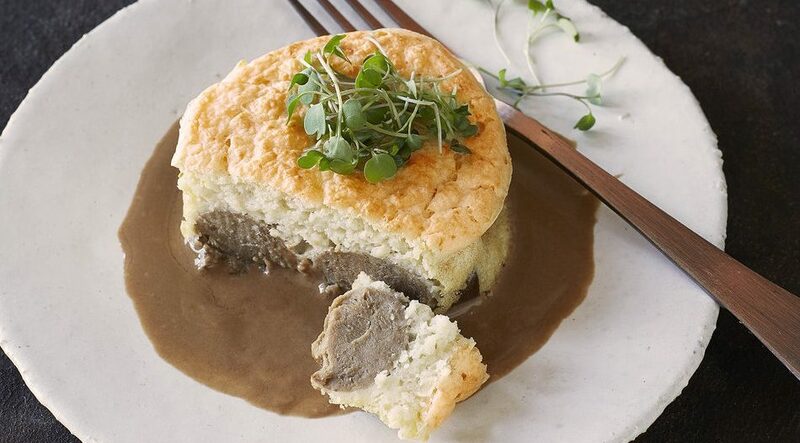 Top with your favourite gravy and garnish with a sprig of rosemary and micro greens. Pour the sticky mixture into your potjie and place on a grid over the coals (low- medium heat) for 30 minutes. While it is cooking, make your sauce by boiling the coconut cream, margarine, sugar, water and vanilla essence together in a pot over high heat. As soon as your pudding is cooked, poke or cut lots of holes into the sponge with a fork/knife and pour the sauce mixture over. Return to the coals (very low heat) in order for the sauce to draw into the sponge.